Spanish statesman, born October 21, 1728 in Murcia and died in Seville of December 30, 1808. He/She made his early studies in his hometown and, already a teenager, went to the University of Salamanca to start in the legal profession, profession that served for some time with his father. Responsible for some judicial affairs by Esquilache, knew how to bring these to fruition, which earned him to be appointed Prosecutor of the Government of Castilla by Carlos III. In addition, mediated Moñino in serious conflicts against the Church that took place at that then in Cuenca, and established the Real pragmatic of 1767 by abolishing the functions of the Jesuits, and his subsequent expulsion, which was reason for his appointment as Spanish Ambassador in Rome, where it marched with the intention of getting the Suppression of the society of Jesus; It was the success of this mission, which earned him the title of count of Floridablanca. El Conde de Floridablanca, painted by Goya. Madrid. In 1777 he/she was appointed Minister and carried out an intelligent policy with Portugal, seeking to improve relations between Spain and its neighbours, and it fostered the progress of Spain in the colonies, because it improved the Navy and cleaned the sea lanes from pirates. He/She knew how to give new luster to the city of Madrid, and had built the Observatory, the Cabinet of Natural history, the Bank of San Fernando and the Philippines company. It neglected neither agriculture nor the construction of canals, roads, and other public buildings. His efforts in foreign policy were frankly successful in American territory, although not be said the same thing about the disastrous campaigns undertaken during his administration, Gibraltar and Algiers which caused censorship to Prime with this understood Minister. On the other hand, the creation of a State Board in 1787, made the animosity against him to reach its climax, since the Board required all Ministers to meet once a week, which was supposed to centralize power in the hands of Floridablanca. In this way, a group of malcontents, headed by the count of Aranda, rose against the despotism of Floridablanca who, seeing the black look that took the situation, decided to leave his post, which failed, since the real testament stipulated clearly that the son and successor of the King should maintain confidence in Floridablanca. 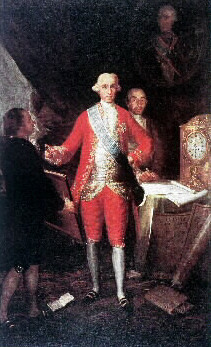 In 1789, Moñino suffered many humiliations; in several pamphlets that ran from Madrid he/she was accused of theft and of disloyalty to the Crown, so weary of the weight of his Ministry, he/she insisted again abandon the policy, what Carlos IV refused to consent, although he/she created several secretariats to somewhat relieve the work of the Minister; These were those of grace and justice, and the Royal House and the heritage. A year later Floridablanca was the subject of an assassination attempt that was threatening his life, he/she managed to escape with good. However, not there ended their penalties, to the death of the King, he/she fell into disgrace, and it was imprisoned in the Citadel of Pamplona, where he/she was quite incommunicado. Aranda, who replaced him in office, ordered to instruct the trial against the former Minister, but when the first left power, in 1808, Floridablanca, which had left free of charge from that process again to appear for a short time on the public stage. The fatigue of his eventful political life led you to seclusion in the convent of Franciscans of his hometown, where he/she stayed until the abdication of Carlos IV, time in which was named President of the Board of Murcia, and after the Madrid, to be at the forefront of the fight against the French invasion. He/She died in Seville, when it withdrew to this city together to the Board, hounded by the Napoleonic troops. During his lifetime, Floridablanca was object of multiple distinctions, such as the Golden Fleece - imposed by the own King-you and left several works, written with clarity and the clarity of style that characterised him, such as allegation the Prosecutor don José Moñino against high report to his Majesty by the Reverend Bishop of Cuenca on May 23Fiscal response on the representations made by Fray Felipe Torres to several propositions of father brother Bussembaum. Letter from the King of Spain, by Clement XIII on the estrangement of the Jesuits, and Memorial presented to King Carlos III and Carlos IV repeated by the count of Floridablanca, waiving the Ministry.